Explore where Hamilton lived and studied, it’s closer than you think! The Annual CelebrateHAMILTON program, hosted by the Alexander Hamilton Awareness Society (AHA), celebrates Alexander Hamilton’s life and legacy. The program in Elizabeth focuses on Alexander Hamilton and his associates in Elizabethtown during the Revolutionary War. Special tours will be offered at Liberty Hall Museum and Boxwood Hall on July 6 and a full day of activities are planned on July 7 at The Snyder Academy of Elizabethtown, including a presentation by AHA President Rand Scholet on the representation of Hamilton in the Broadway Show “Hamilton”, a lecture by historian Michael Newton on Hamilton and his Associates in Elizabethtown during the Revolutionary War, a musical concert featuring colonial music on period instruments, and a staged reading of the writings Hamilton, Livingston, Boudinot and Dayton by the Actors Shakespeare Company, the theater-company-in-residence at The Snyder Academy. Explore historic sites associated with Alexander Hamilton’s time in the Elizabethtown, New Jersey area as a young preparatory school student, having just emigrated from the Caribbean. Activities throughout the Elizabeth, NJ area were taken place at Boxwood Hall, Liberty Hall and The Snyder Academy of Elizabethtown. Alexander Hamilton arrived in Elizabethtown, NJ in 1772 and attended the Old Academy School to study and prepare for college studies. During this time period, Hamilton went under the personal guidance of NJ’s first governor William Livingston and lived nearby at Liberty Hall with the Livingston family. Along with building that strong relationship, Hamilton also built a strong friendship with Elias Boudinot, who lived in Boxwood Hall. During Hamilton’s time in Elizabethtown, he would frequent Boxwood Hall to spend time with his good friend and also built a close bond with Boudinot’s family. Tour the historic home of Elias Boudinot, that was frequented by Alexander Hamilton. Discover the unique bond of the two historical legends and walk through history in modern times. Program Times: 10:00 a.m. or 11:00 a.m. Hosted by the Alexander Hamilton Awareness Society! The annual CelebrateHAMILTON program celebrates Alexander Hamilton’s life and legacy. Liberty Hall Museum is excited to be stop #2 on the Young Immigrant Hamilton Tour! While attending the Academy of Elizabethtown, Alexander Hamilton stayed with the Livingston family in Elizabethtown. As a follow-up to last year’s sold-out “New Hamilton Discoveries” talk at Liberty Hall, new discoveries about Alexander Hamilton made over in the past year will be shared for the first time publicly at Liberty Hall. Speakers include Hamilton National Scholar Michael E. Newton and Aime Fernandez-Puente, Elizabeth Local History and Special Collections Manager at the Elizabeth Public Library. Don’t miss your chance to be the first audience to learn these discoveries! Michael E. Newton shares with the public for the first time his recent discovery of the earliest known records of Alexander Hamilton. The author of Alexander Hamilton: The Formative Years will discuss the discovery of these documents and their implications to Alexander Hamilton’s biography. Enlarged copies of the documents will be on display for the public to see for the first time ever. Also, reading an excerpt from his new Hamilton manuscript, Michael E. Newton will share a previously unknown story about Nicholas Cruger’s participation in a “supposed duel.” As Cruger’s employee, young Alexander Hamilton had a front-row seat to this “sensation” and the “disorder” it created. Following immediately afterwards, discoveries from the Library Vault: Elizabeth Public Library’s Hamilton Documents will be revealed. Elizabeth Public Library Local History and Special Collections Manager, Aimee Fernandez-Puente shares with the public the recent discovery of Alexander Hamilton documents found within the Library’s vault. Ms. Fernandez-Puente will discuss the history of these documents and the individuals referenced. An original document from the collection will be on display for the public for the first time since its discovery. Your admission to the “New Hamilton Discoveries” event also includes a 1st floor tour of the Liberty Hall Museum. 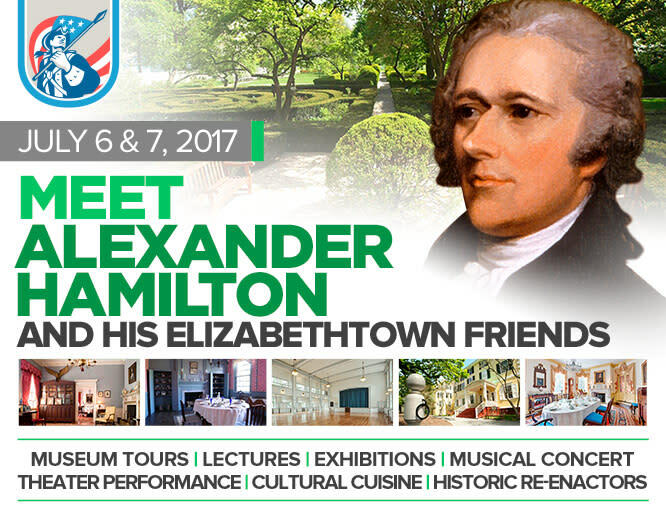 For more information on the CelebrateHAMILTON 2017 program & all things Alexander Hamilton, visit http://the-aha-society.com/. Program Times: 1:00 p.m. or 3:00 p.m. Program Fee: (Special for CelebrateHAMILTON) $10 admission for all attendees in honor of Alexander Hamilton. A full day of events (in both English & Spanish) that will highlight Hamilton’s relationships with key figures from Elizabeth, including Elias Boudinot, William Livingston and Jonathan Dayton. Activities for the day will include historical talks and a book signing, a theatrical presentation, a music concert and a history fair. Program Times: 10:00 a.m. – 9:00 p.m.